Combine almonds and half the flour in a food processor and blend until almonds are combined into the flour and it resembles a coarse meal. Add in the rest of the flour and process to combine. If you are using almond meal you can combine it and all the flour at once. Add in the salts and process to combine. Place butter in the bowl of a stand mixer fitted with the paddle attachment and beat on medium speed until light colored and creamy. Add the sugar and beat on low speed until combined, about 3 to 4 minutes. Add in egg yolks, one at a times, and then the vanilla extract, beating between additions until combined. Scrape down the sides of the bowl with a rubber spatula as needed. Add the flour mixture and mix on low speed just until dough starts coming together. Don't let it turn into a solid ball. Turn out dough onto a clean surface and gently knead it together by hand. Divide dough into two parts, flatten into a rectangle, and wrap in plastic. Refrigerate for at least 2 hours until dough is chilled and firm. Roll out the dough, one piece at a time, between two pieces of parchment paper or two silicone baking mats to about ¼" thickness. Dust the dough with flour to help prevent sticking. Place the dough, still between parchment paper or baking mats, on a baking pan and place back in the refrigerator for 30 minutes to re-chill. Preheat oven to 350 degrees F. Line several baking pans with parchment paper or silicone baking mats. 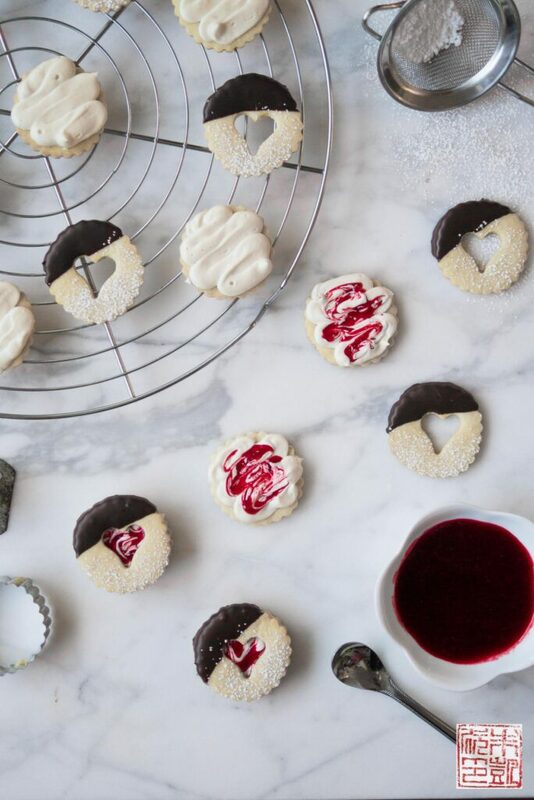 Cut out shapes from the dough with a cookie cutter and place on baking sheets. Pierce each of the cookies a couple times with a fork. Bake cookies for 10-12 minutes, rotating pans once, until cookies feel firm to the touch and are light golden brown around the edges. Combine the raspberries, sugar, and framboise in a medium bowl. Let the mixture sit for about 2 hours. Cook the mixture in a heavy, medium saucepan over medium heat until it just comes to a boil. Reduce the heat to medium low and cook until most of the liquid has evaporated and the jam is thick enough to coat the back of a spoon, about 30 minutes. You can strain the seeds out of the jam if you want. Let jam cool. Break the white chocolate into pieces and place in an 8-inch square baking pan. Bake chocolate for 15 minutes. Use a rubber spatula to stir the chocolate to help it melt evenly. Continue baking, stirring every 5 minutes, until chocolate turns caramel brown, about 25 minutes total. The chocolate may turn crumbly and grainy. Scrape the chocolate into the food processor and blend until smooth. Let it cool while you make the rest of the frosting. Add the sugar and beat on low speed until combined, about 3 to 4 minutes. Scrape down the sides of the bowl with a rubber spatula. Add in the white chocolate, vanilla bean paste, and salts. Beat until fully combined and smooth. Add in orange blossom water and beat to combine. Fill a pastry bag fitted with the Ateco #804 tip with the frosting. Pipe rows of frosting on half the cookies. Place a small spoonful of raspberry jam on top of the frosting and swirl in with a wooden skewer or fork. Place the other half of the cookies on top. Line several baking sheets with parchment paper. Dip the cookies in the melted chocolate. Place on the lined sheets. Refrigerate until chocolate is firm, about 1 hour.